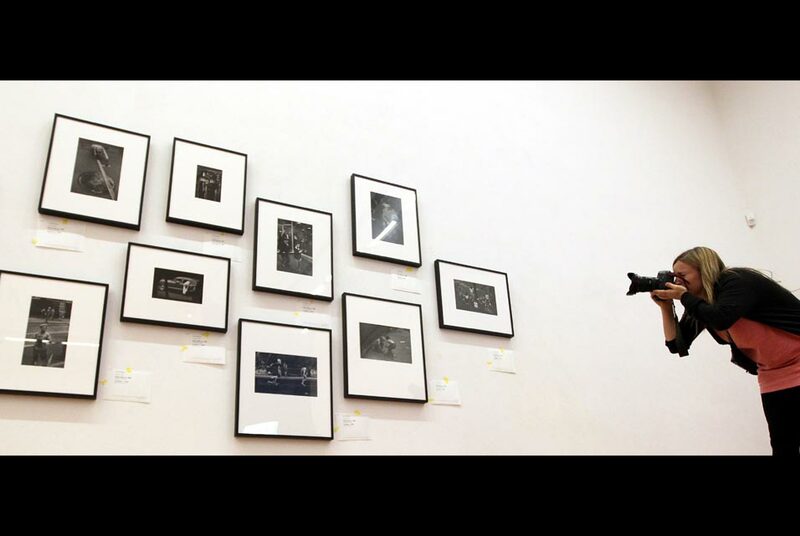 A visitor takes a picture of framed black and white photographs at the Martin-Gropius-Bau exhibition venue in Berlin, Germany. The images are part of the exhibition about US photographer W. Eugene Smith and are shown under the title 'A Retrospective' until 27 November 2011. EPA/WOLFGANGKUMM. BERLIN.- W. Eugene Smith, who was born in 1918 in Wichita, Kansas, and died in 1978 in Tucson, Arizona, first made a name for himself as a politically and socially committed photojournalist in the USA in the 1940s. Many of his photographic reports appeared in Life, the leading picture magazine that had been launched in New York in 1936. Smith saw in photography more than just an illustration to a text and had often asked editors for a greater say in the composition of a photo-essay. His painstakingly researched and emotionally moving features set new standards of photojournalism in the 1940s and 1950s. Smith had begun to take photographs as a fifteen-year-old, having been inspired by his mother, a keen amateur photographer. In 1936, following the suicide of his father as a result of the Great Crash, Smith initially enrolled at the University of Notre Dame, Indiana. But he dreamed of becoming a photographer and moved to New York, where he attended the New York Institute of Photography. He embarked on his professional career in 1937 as a photo reporter for Newsweek. A year later he began to work as a freelance for the Black Star Agency, and his pictures appeared in Harpers Bazaar, Colliers, Time and Life. With Life he was to have a close association that went on for years. When the USA found itself at war at the end of 1941 Smith initially took propaganda shots for the magazine Parade to support the American troops. Then, as a correspondent for Flying magazine, he took part in reconnaissance flights, taking photos from the air. In 1944 he was back on the staff of Life - this time as a war correspondent - documenting the battle of Saipan and the American landings on the islands of Iwo Jima and Okinawa. In the course of the fighting the style of his photos changed. Instead of being gung ho they tended to focus on the terrible sufferings of the civilian population and were shot in a way that involved the viewer emotionally. On 22 May 1945 Smith himself was seriously injured, forcing him to submit to a series of operations that went on until 1947. After his recovery he went back to work for Life again. Documentary features showing the dedicated work of ordinary people were particularly popular with readers. In The Country Doctor (1948) he accompanied a young country doctor from the Denver area on his rounds for several weeks. His report Nurse Midwife (1951) on the black midwife Maud Callen was produced against a background of racial discrimination and the brazen activities of the Ku Klux Klan in the Deep South. In developing the prints Smith adjusted the lighting so as to enhance the emotional atmosphere - during a birth, for example - and so arouse sympathy for the selfless efforts of the midwife. His social commitment, however, did not always meet with approval, as in the case of the unpublished report (1950) on the re-election campaign of Clement Attlee, the candidate of the British Labour Party. Life intended the report to strengthen indirectly the position of the Conservatives by presenting the results of Attlees nationalization policies in a critical light. Smiths coverage, however, aroused sympathy for Attlees programme and the candidate himself. Smith had more success with his Spanish Village feature (1951). He wanted to convey an impression of living conditions under a fascist regime. After obtaining the necessary shooting permission, he spent two months studying the Spanish countryside before finally selecting a remote village in the Estremadura as his subject. Not a few of the photographs, with their chiaroscuro and clearly structured composition, are reminiscent of classical paintings and convey by means of this stylistic device a sense of the hardships but also the beauty of life there. Smiths feature on the work of Albert Schweitzer in Lambaréné was to be his last for Life whose refusal to give him a say in the selection and layout of pictures had become unacceptable, and he left the periodical after the appearance of his photo essay Albert Schweitzer  Man of Mercy in November 1955. A career alternative offered itself in the shape of membership of Magnum, the photographers agency founded in 1947. Stefan Lorant commissioned Smith to do an extensive feature on the city of Pittsburgh and its iron foundries, which occupied him for the next few years and nearly exhausted his financial and personal resources. Instead of the 100 prints agreed with Lorant, there arose 13,000 shots out of which he wanted to compose an essay which would be entirely in line with his convictions. In 1958 88 photographs were published in Popular Photographys Annual Guide, although the essay never appeared in its entirety. In 1957 Smith, who was known for his excessive devotion to his work, had left his family and moved to 821 Sixth Avenue in New York. The house was visited and used for rehearsals by many well-known jazz musicians, and Smith, who was a passionate music lover, photographed and documented this creative milieu over the next few years, while also keeping an audio record on 1,740 tapes, which were only discovered among his posthumous effects in 1998. At the same time he photographed street scenes from his window while also working on the construction of a psychiatric clinic in Haiti. In 1961 a commission from the Cosmos PR Agency to photograph the company Hitachi Ltd. took Smith to Japan for a year. This was followed in 1963 by a book which contrasted modern Japan with its deeply rooted traditions. A decade later he again turned to the forced modernization of Japan and its grave consequences with a shocking series about the Minamata epidemic which had been triggered by the environmental pollution caused by the chemical concern Chisso, which had discharged mercurial waste into the sea near the town of Minamata. The Committee for the Defence of the Victims hired Smith to document the human and ecological dimensions of the catastrophe, and the photographer, who threw himself heart and soul into the project, moved with his second wife, Aileen Mioko Smith, to Minamata. In the course of his researches he was beaten up by company security guards and severely injured. The pictures he took, which appeared in Life and his book Minamata: A Warning to the World largely contributed to publicizing the scandal. By the early 1970s Smiths photographic work was attracting the attention of museums. His photo A Walk to Paradise Garden had already been selected by Edward Steichen as a symbolic climax to the exhibition The Family of Man (1955), but it was not until 1971 that the first retrospective Let Truth Be the Prejudice was held in the Jewish Museum in New York. In 1977 Smith, by this time seriously ill, moved to Tucson, Arizona, to take up a teaching post at the university there in what was to be the last year of his life.